Ever use one of these? It’s a Hudson Shooting Watch. They came out in Japan in the ’80s and were reissued in the late 2000s. 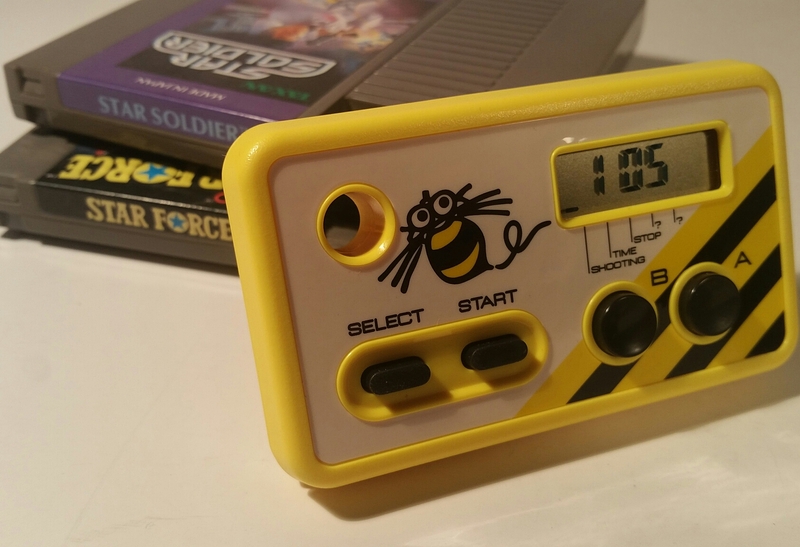 It’s a gadget that measures how many times you can press a button in 10 seconds, thereby telling you how many shots per second you can achieve, which I guess is useful information if you’re a shmup enthusiast, which I am. The Shooting Watch was made popular by (or maybe it was made FOR) Hudson’s human mascot, gamer Takahashi Meijin, who was famous for his superhuman ability to fire 16 shots per second. Although many shooting games limited the number of shots you could have onscreen at one time, some games, such as Star Soldier, had no such limitations and consequently, the more shots the player could physically fire, the more formidable his offensive capabilities. Maybe this was before controllers came equipped with turbo functions, I’m not really sure. Anyway, if you try out one of these Shooting Watches, you’ll quickly see that a rate of 16 shots per second is NO JOKE. I’m pretty fast and as you can see in the photo above, my best is 105 button presses in 10 seconds, which of course shakes out to 10.5 shots per second. Meijin’s rate of 16 shots per second became his calling card (his official website is at www.16shot.jp) and sort of a legend in the Japanese gaming community. There’s even a videogame bar in Tokyo called 16 Shots (whose website is at the very similar and easily confusable www.16shots.jp), a clever combination of both gaming and drinking references. I’m not sure how much an original or reissued Shooting Watch will set you back these days, but I don’t think new units have been available for years now. Variations existed such as Super Shooting Watch (modeled after the Super Famicom controller) and Capsule Shooting Watch (mini versions in various design themes). There was even a Nintendo DS game available as a DSware download called 16 Shot! Shooting Watch which basically just replicated the experience on your DS, and added progress charts and leaderboards. So have you tried a Shooting Watch? What’s your record?